No, that isn’t the Fire Brigade racing into Hall 1 to put out someone’s cigarette. 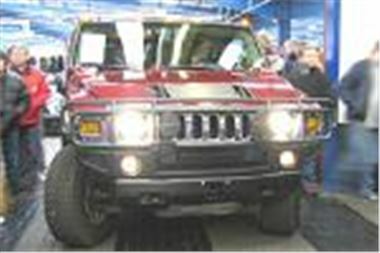 It’s a Hummer H2 6.0 V8 LTD. This isn’t the Swartzenegger, Frank Warren, Gulf War original Hummer. It’s a GM truck-based second-generation H2 and quite a bit higher than the original. So high, the first one I saw had managed to get its roof bars jammed against the air-conditioning trunking in the Puerto Banus underground carpark and neither I nor the driver knew how to auto deflate the tyres to get it out. Top bid for this virtually new 53 reg giant Tonka Toy was £46,000. Back in the real world, anyone who heeded what I wrote about Top Car auctions on Friday would have been quids in today. A bank was disposing of several Three Series at no reserve. As a result, a really sweet, nicely specced 33k mile 02 reg 320i 2.2 SE Touring sold for £15,500; a 69k mile 2001Y 320d SE sold for £12,550; and a 59k mile 2000W 318i SE Touring with lots of kit on it sold for £9,950. Not rock bottom cheap by any means, but far from silly money either. Other reasonable buys included a 56k mile 2000W Audi TT 225 coupe sold for £15,800; a 21k mile 2002/52 Mercedes W211 E220 CDI Avantgarde auto, sold for £24,500; a 52k mile 2002/02 330CI auto coupe with everything on the options list, sold for £21,000; and a classic 75k mile 97P Bentley Brooklands, sold for £27,000. There was plenty going on in the other halls, too. A 113k mile 2000X Hyundai XG30 looked cheap at a starting bid of £1,800, but went on to sell for a strong £3,100. A 42k mile 2000W RenaultSport Clio 172 was fair money at £6,100. A 7k mile 2003/52 reg Espace 2.2DCI Privilege bid to £18,200, which is about what you would expect. And, sorry Vectra Owners, a 138k mile 96N Vectra 2.0GLS failed to get past a provisional £275.